Going into this book, I wasn't really sure what genre to expect - and in the end, I suppose I still don't have one genre to put it into. 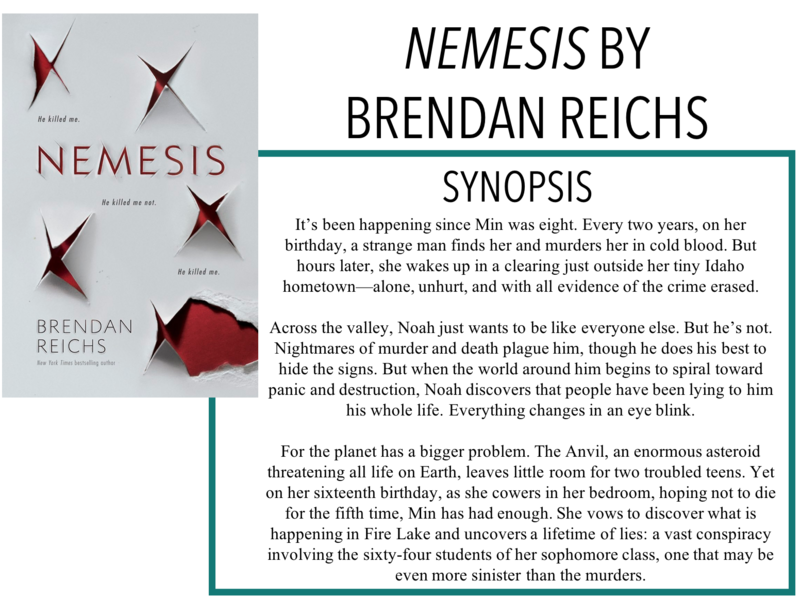 I am back with another book review, Nemesis by Brendan Reichs! This book follows 16-year-old Min who, every other year, on her birthday, is hunted down and killed. After the first few times, people stopped believing her and wrote her off as crazy. But Min knows that what's happening is real - she just doesn't know why. On the other side of town, Noah is dealing with his own issues. Every other year on his birthday, he has nightmares of being killed - except he doesn't remember falling asleep. The only person he trusts is Dr. Lowell who is always there to calm him down. However, Min and Noah's problems are bigger than themselves - a major asteroid is set to crash into earth, causing unimaginable damage. As the world finds out how close they are to come to death, Noah and Min decide they've had enough of their own deaths. I was pretty interested in the book from the get-go. I wasn't sure what path Reichs would take to explain everything - whether it be a sci-fi thing, a dystopian thing, or just a psychological thing. In the end, I guess it was kind of all three. I won't spoil anything but I will just say that towards the end, this book gave me some major Lord of the Flies meets Alive vibes. The plotline was intriguing and - I would say - fairly original. I didn't see most of what happened coming, especially a number of the more fatal occurrences. The pacing was a bit off towards the middle and I think the book could have been a little shorter. I felt like there were some moments where nothing really important was happening (some things I recognized as not super important at the time, and now that I've read it, I can look back and see that it wasn't super important). Regardless, I look forward to where the story will go in the future, I'm hoping things will take more of a sci-fi turn, but we'll see! The characters themselves were pretty good. I liked most of the main ones. Min was probably my favourite, she was honest and trustworthy and kept a level head. Tack was a bit impulsive at times, and I wasn't entirely sure whose side he was on for some of the book. Noah was another good character, most of the time he was able to recognize his privilege and while he wavered a bit, he stuck to his decisions. Overall, I am excited to pick up the next book it the series, I'm hoping to see a growth in the writing as well as the story itself.